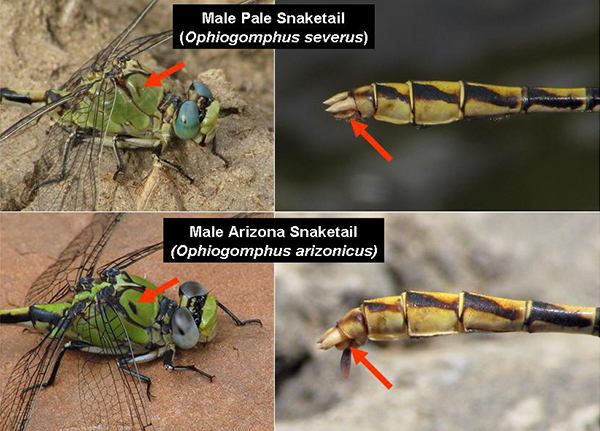 Two similar-looking snaketail (Ophiogomphus) species are found in Arizona: the Arizona (O. arizonicus) and thePale (O. severus) Snaketails. The Arizona Snaketail is found in several counties across the middle of the state and the Pale Snaketail is restricted to streams of the Chuska Mountains, Apache Co. The two species could potentially coexist at a same location but this has not been observed to date. To separate males of the two species, focus primarily on the shape of the appendages and secondarily on the color of the thorax. Arizona Snaketail: epiprocts extend to ~50% the length of cerci. Arizona Snaketail: black oval antehumeral mark is more developed than in the Pale Snaketail. Lateral views of the thorax and appendages of male Pale (Ophiogomphus severus) and Arizona (O. arizonicus) Snaketails, AZ.